A recent article in Inside Higher Ed revealed that Wyoming is the best state in the nation in terms of state funding for higher education. In a recent report done by Young Invincibles, each state received a report card grading its support for public higher education. Wyoming was the only state to receive an ‘A’ grade. 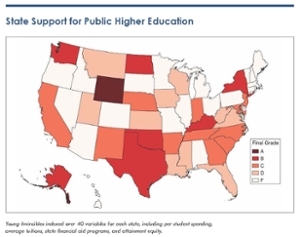 The report looked at the tuition costs of the higher education institutions in each state, as well as how much money the state was spending per student. Between a combination of low tuition costs, and large budget support from the state for education, Wyoming has been able to keep public higher education affordable with the least debt burden to students and families. While Wyoming is clearly ahead of the curve, it is not without its own challenges. National trends indicate an increase in tuition costs to offset state budget cuts. Wyoming has experienced these as well. Fortunately, due to the state’s investment in education and the commitment to keeping the cost of attendance affordable, Wyoming is projected to remain the most economically viable state in which to pursue an education.